Oh yes! you guessed it... Little Joe Chickapig cookies! Omigoodness I wish you could have heard the squeals when they saw these sitting on the table. 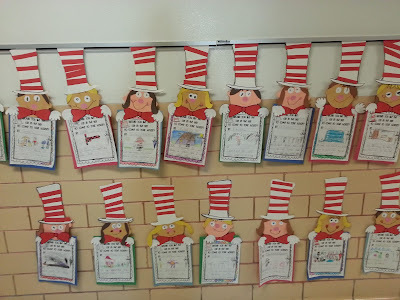 Happy, motivated kiddos sure do make this teacher's heart smile! I hope everyone has a fabulous weekend! Yep! Thats's right LJC was doing a little egg-sitting for some of the hens back at the Chickapig farm & asked us for a little help. Of course we said yes & quickly discovered that egg-sitting is a lot of work. We had to check the eggs often to be sure that they were safe and warm. We also had to carefully turn them...just like the mama hen does. (Shhh, don’t tell them but they are also getting a little extra practice telling time!) We used our "EGG-SITTING LOG BOOK" to keep track of all of this. First, all of the students made a warm and safe nest to keep their egg in. Many also chose to cover it with a little blanket (since they were a little too big to sit on the egg to keep it warm! lol) Awww, they're so stinkin' cute! We stopped about every hour to do an "egg check" (I tried to stop on the hour since my students were just learning to tell time to the hour.) The wrote down the time, turned the egg and check to be sure it was warm and safe. At the end of the school day, my students decided that they wanted to put the eggs back under Chickapig. When I asked them if they wanted to take their eggs home with them they said, “No we want Chickapig to keep them warm so they hatch!” Hmmm... ??? Fast forward to the next morning... WOW! Little Joe Chickapig is one awesome egg-sitter chick-sitter! We found 6 adorable little fluffy chicks & a note. Omiword! these kiddos were beyond excited! A few things that I heard that morn... "Chickapig you did it!" "Thank you for keeping the eggs warm all night!" "He followed his heart!" "I guess he took the rest of the eggs back to the farm." 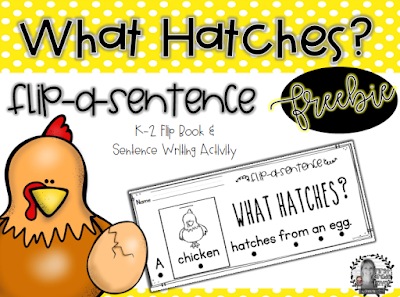 Be sure to check out my "What's Hatchin' Chick" unit for the Egg-Sitting Log Book that we used in this post plus oodles of other activities to go along with your hatching unit. Thank you so much Little Joe Chickapig for hanging out in our classroom and inspiring all kinds of learning fun! Also, be sure to check out the Chickapig Facebook page! 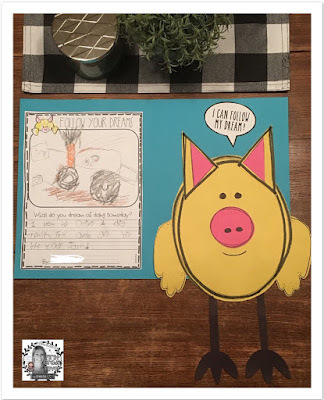 Last week I found the most amazing resource for teaching young children the importance of following your dreams... LITTLE JOE CHICKAPIG: A Story About Following Your Dreams! It was released earlier this month & is sold exclusively at Target right now. It is so stinkin' cute!! ...and that plush CHICKAPIG toy...irrisistable!!! Omigoodness! 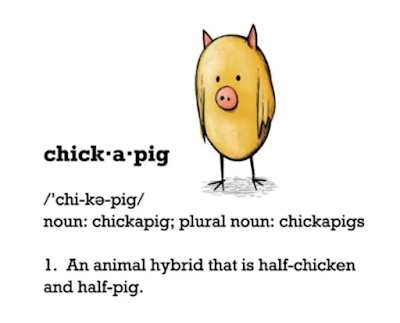 Soooo...just what is a CHICKAPIG??? Hmmm...CHICK---A---PIG?? That's exactly what I was thinking when I spotted this thing perched up on that shelf in Target the other night. Then I opened up the book and... Ta Da!! !...my question was answered. I LOVE LOVE LOVE it! What a cute and unique little dude! ...the perfect character for this story. 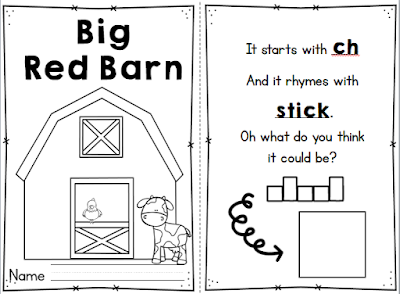 This adorable rhyming book is written by Brian Calhoun and illustrated by Pat Bradley and Brian Calhoun. In addition to being the author of this book, Brian Calhoun is also a well-respected custom guitar maker. He has apparently made guitar for famous stars, including Keith Urban, Jason Mraz & Dave Matthews just to name a few! WOW!!! He sure knows how to follow his dreams-from guitar maker to children's book author! Rock on Brian!!! LITTLE JOE CHICKAPIG has a very clear message that ALL children need to hear: Follow your dreams, whatever they may be. (And, as adults, I think its important for us to be reminded of this from time to time also.) As C.S. Lewis said, You are never too old to set a new goal, or to dream a new dream. Some days I'm still trying to decided what I want to be when I grow up! lol ;) As a teacher, I believe that instilling courage & confidence in my students gives them the power to accomplish anything that they set their mind to in this big 'ole world. What message can kiddos get from this book? 2. Have courage to try new things. 3. Listen to advice from your parents, teachers & other grown ups in your life. I am so in love with this book & the message that it sends! 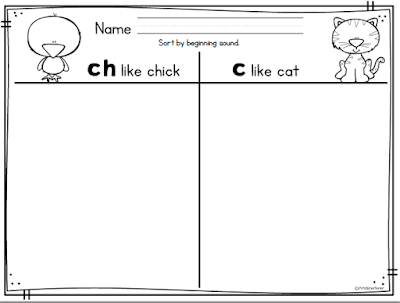 I really wanted to find a way to extend my students' learning so I decided to create a few extension resources to compliment the story of LITTLE JOE CHICKAPIG. I made several versions of "Follow Your Dreams" writing prompt to match your students' writing levels. 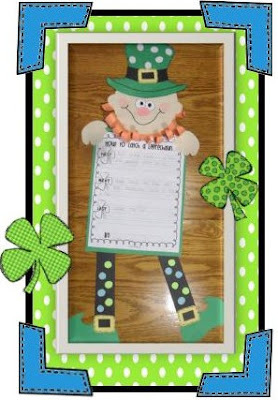 This writing craftivity can be easily differentiated for kinders, firsties or 2nd graders. 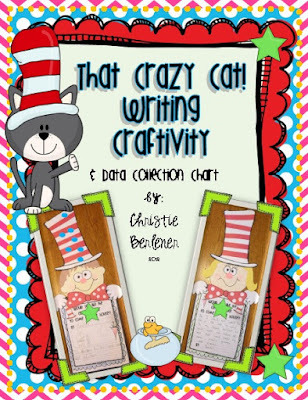 Click on the book to check out this resource! Just in case you're wondering, this kinder wrote: I want to drive a big monster truck and go to the Monster Jam. This sweet little guy has come so far with his writing this year and all he ever talks about OR writes about OR draws about is monster trucks! I was definitely not surprised to see this was his dream! So darn cute!! This book is truly one of my favs! I highly recommend that y'all get out and make that Target run & grab yourself a copy! And don't forget to always FOLLOW YOUR DREAMS! P.S. 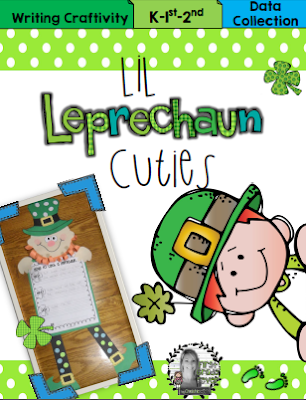 Be sure to look for the little cow on each page of the book! Happy Wednesday! 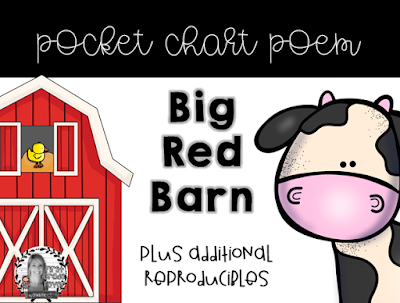 I just finished up this little Pocket Chart Poem Kit just in time for our farm theme next week! 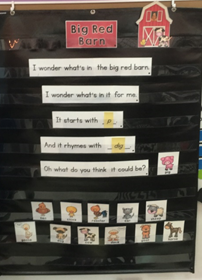 This poem does a great job of promoting those super important phonemic awareness skills with your kiddos! Not only does this include the pocket chart version of the poem but also poems for your poetry notebooks. 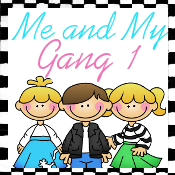 Click on the pictures to check it out! Check out this reproducible mini-book! 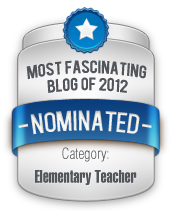 My kiddos love this! There are also a couple of sorting reproducibles included! Oh my goodness y'all! Look what I found at Target tonight!!! Ahhhhh! I just can't take all the cuteness! My kiddos wanted to go browse in the book section when we made a quick run to Target. And by quick I mean that I squeezed in time to grab a quick drink at Starbucks AND wander aimlessly through the Dollar Spot shelves AND all those cute spring purses.... well... you get the picture-it was a typical Target trip...just shopping for all the things we don't need. LOL Anyway back to this stinkin' adorable book... That CHICKAPIG stuffed animal caught my eye instantly! Ohhhhh it's just so cute but "What the heck is a Chickapig?" is what I was wondering. So I grabbed the book and mystery solved! 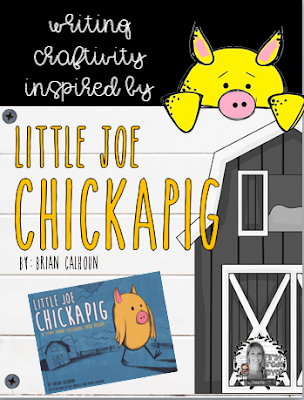 Be sure to check back soon-I've started creating a few reproducibles and writing prompts to go along with Little Joe Chickapig! Be sure to check out some of my other products like "What's Hatchin' Chick?" or "Big Chickens Writing Craftivity"! 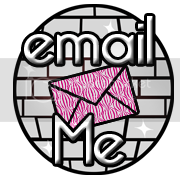 Please be sure to leave me feedback after your free download. Hope you love it-Happy Spring!